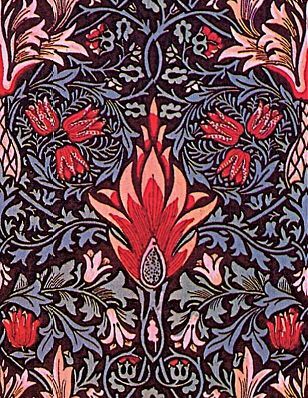 William Morris (1834-1896) was a nineteenth century artist, designer, craftsman, writer, thinker, lecturer, socialist, ecologist, book producer, business man, and practically any other title you can think of. He is also Maureen’s most important influence and most consistent source of inspiration. When Maureen made the switch from stoneware to porcelain clay, she started to think more seriously about decorating. For inspiration, she looked to the past. She fell in love with ancient Islamic tile work, Persian carpets, Japanese kimonos, Fair Isle knitting patterns, and African batiks. 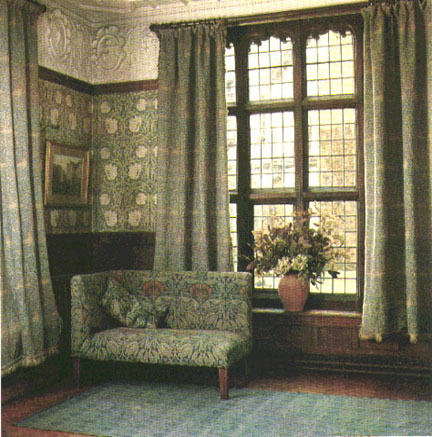 It was during her travels through pattern that she discovered William Morris, who also drew on the past–specifically, on Islamic and Medieval art–for inspiration. 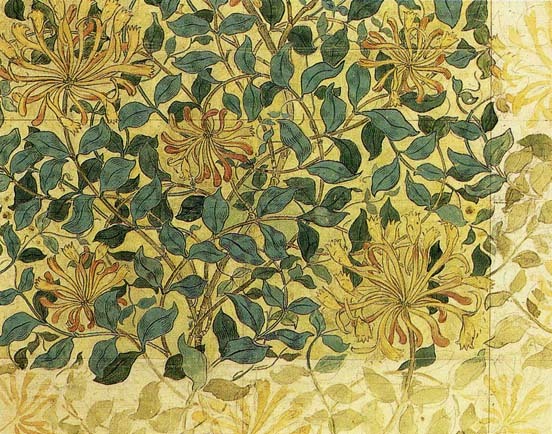 Maureen grew attached to Morris for the quality of his work, but also for the force of his ideas. 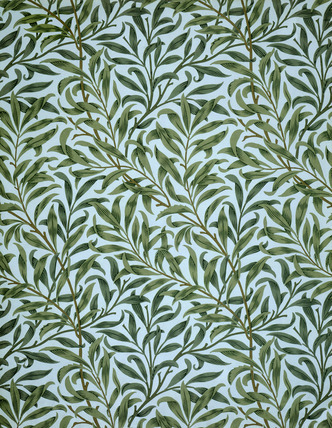 Much of Morris’ aesthetic was a reaction against the Industrial Revolution; against its division of labour and the fragmented, hasty world of mass production it created. People no longer took time and care to make an object with their hands. They were rarely involved with a project from start to finish; they simply made one part of it, then passed it down the assembly line, and so took little to no pride in its completion. The result, to use a Marxist term, was a profound sense of alienation from the objects one helped make and from the objects among which one lived. This, argued Morris, was society losing its way. Morris saw great value in seeing a creation through from start to finish, from design to finished product, whether that creation was wall paper, a carpet, a book cover, or a piece of pottery. He also believed that we should use those beautiful objects, incorporate them into, and thereby enrich, our daily lives. 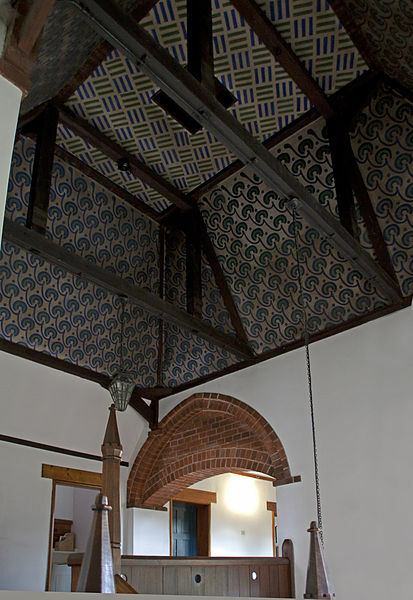 “Have nothing in your house that you do not know to be useful, or believe to be beautiful,” is one of Morris’ most famous quotes, but it seems that perhaps he preferred to combine those two adjectives–useful and beautiful–whenever possible. Morris’ philosophy of living resonates with Maureen. She, too, believes in the importance of surrounding oneself with beautiful things, of creating objects by hand, and of living with art. She, too, believes that “the true secret of happiness lies in taking a genuine interest in all the details of daily life.” Finding joy in the colour of your bedspread, in the shape of your coffee cup, in the painting hanging on your wall, in the cut flowers on your desk. Before Maureen encountered Morris, she was more timid with her patterns; she tended to stick to borders. But Morris’ work, and his philosophy, made her want to do more. When the National Gallery put on a Morris show in 1993, Maureen went numerous times. She saw the wood blocks he used to make prints, and was thrilled by the richness and complexity of his patterns. 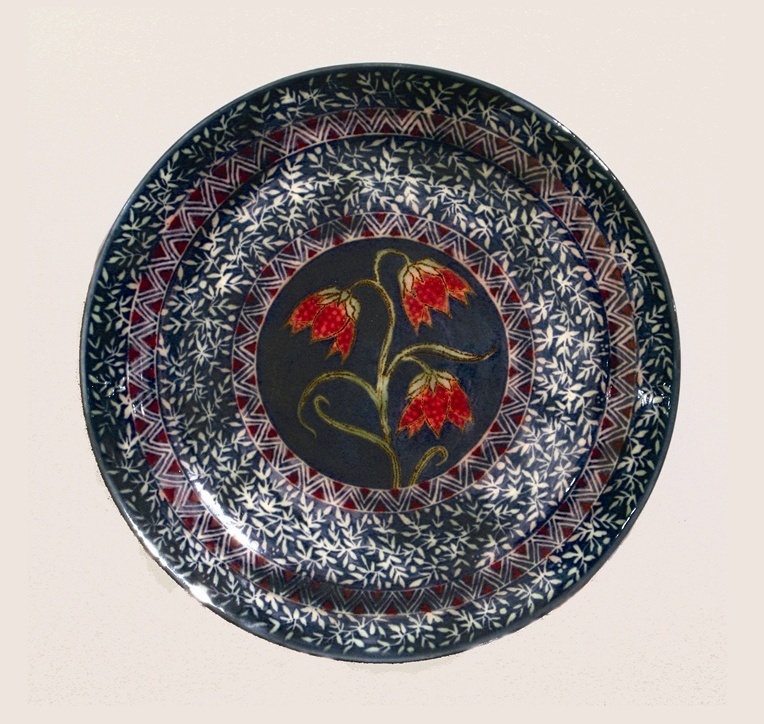 She began decorating the entire surface of her pottery, layering colour and line, and, like Morris, drawing on then ordering the natural world for subject matter. Above all, Morris is to Maureen a validation of an outlook. Sometimes, Maureen explains, you are just following along a path, not always conscious of your motivations, until you come across someone like Morris, who puts it into words for you, or exemplifies it through the very texture of his life. And then you think, Aha, this is why I do what I do. “With the arrogance of youth, I determined to do no less than to transform the world with Beauty. If I have succeeded in some small way, if only in one small corner of the world, amongst the men and women I love, then I shall count myself blessed, and blessed, and blessed, and the work goes on.” -William Morris. This entry was posted in Marcotte by mckenziemarcotte. Bookmark the permalink. Thank you Allegra for this glimpse into the motivation behind Maureen’s beautiful work–absolutely inspiring! I hope she feels blessed by the beauty she creates. We certainly do. Thank you for this wonderful comment, Grace. Wonderful to read about this vital source of inspiration for Maureen’s beautiful pots. Allegra, you take us below the surface, and we discover more about Maureen’s patterns as well as the life view that informs her work. Thanks! Thanks Mary Lou! I’m always glad when you (such a close friend for so many years) discover something new. What a lovely article. It speaks to my love of decorating which has most definitely come from my mother. Maureen …. you are an inspiration as well. Your work is breathtaking. Thank you, Cathy! I’m so glad you enjoyed it.